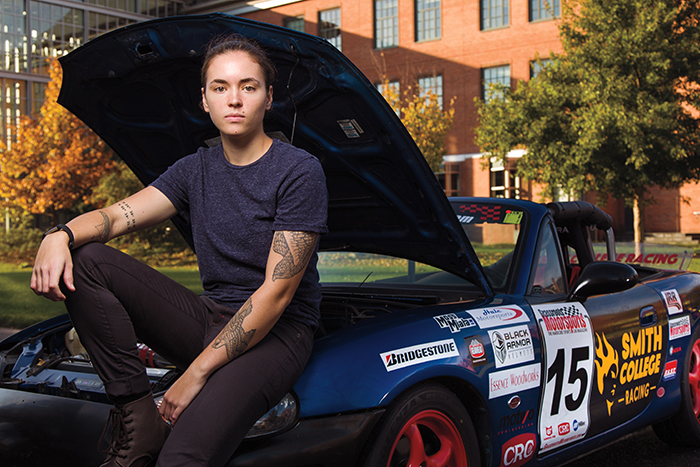 Racing enthusiast Gracie Hackenberg ’18 competes in the Grassroots Motorsports Challenge. The electric-blue Mazda Miata with the bright-red accents was the first car built by an all-female team to compete in the Grassroots Motorsports Challenge. Behind the wheel was Gracie Hackenberg ’18, a racing enthusiast who put her engineering major and economics minor to work building the car for just $2,017—the maximum budget for all entrants in this year’s event, which took place in October at Florida’s Gainesville Raceway. Hackenberg worked on the car almost every day for four months, but as a first-time contender in the three-part competition, which involves an autocross obstacle course, drag racing and concours judging, she simply wanted to finish. Instead, she and teammates Alysha de Silva ’18 and Jessica Wert ’18 came in seventh overall in a 40-team field and won the Editors’ Choice award for Grassroots Motorsports magazine’s favorite entry. Inspiration: I grew up working on cars with my grandpa. He wasn’t really into motor sports, but he loved vintage cars. He had a Porsche and a Volkswagen and a Jag. That’s definitely where I started to love cars. And I started going to the track in high school after I got my license—and a few speeding tickets—and I fell in love with the culture there. 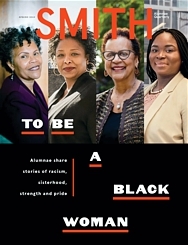 What’s the appeal? I mean, I love speed. That’s the biggest thing. I love driving, but I also like the idea of making cars more efficient and more powerful and cheaper. That’s the engineering side that interests me. Getting started: Dean Case [Mazda Motorsports’ communications officer and husband of Joni Gang ’84] came to Smith to give a talk. The following weekend he was going to Watkins Glen [International race track in New York] for a race. He invited me and a few other students. We all went out and saw the race, and it was awesome. We met lots of engineers and lots of other Mazda racers. Favorite part of the build? Doing the cold air intake system. It was the first thing that was really working on the engine, which is what I want to do. The rest of it was building the roll cage and fitting the seat and doing all that stuff—which is fun, but it doesn’t really feel like you’re working on a car until you’re working on the engine. Autocross or drag racing? Autocross, definitely. The drag race is really more about just having a fancy car that can go fast in a straight line. Autocross is about your skill as driver, but it’s also about how well you’ve prepped your car. There are a lot more variables that occur in autocross. Race track as recruiting ground: Dean refers to the cars as rolling résumés. A lot of people at the event are engineers in different fields—sound engineers, electrical engineers—so it was definitely a networking opportunity for me. Also, it’s just great experience for me when I go looking for a motor sports job. I want to work in IndyCar or Formula One, but IndyCar’s the dream. Women in motor sports: It is very obvious that women are the minority in motor sports. I see a few women at the track; it’s mostly men. But overall, the racing community is super accepting. They’re all awesome, and I’ve had so many people help me and be on my side. I haven’t really experienced any sort of discrimination. I definitely feel comfortable at the track, like it’s my place.